Delivering complete coverage of ASE Education Foundation's Maintenance & Light Repair (MLR) program standards, this accessible, practical resource features material spanning the entire MLR task list, as well as many supplemental tasks entry-level technicians need to master. With an engaging writing style and abundant images and illustrations, this reader-friendly text makes even complex material easier to understand. Proven learning features are integrated into every chapter, including Word Walls highlighting key technical and industry terms and ASE review questions to help you prepare for professional certification exams. 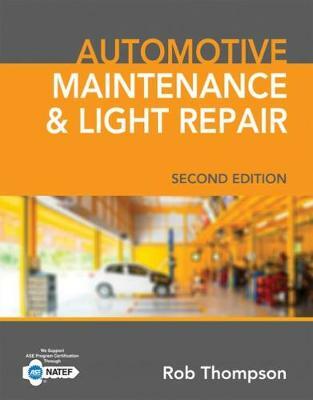 Giving you a solid grounding in both automotive competencies and academic and lifelong learning skills like math, science, and communication, AUTOMOTIVE MAINTENANCE AND LIGHT REPAIR, Second Edition, is the perfect choice to prepare you for classroom and career success.